The Peak Forest Tramway once linked Bugsworth Canal Basin, at the head of the Peak Forest Canal, to the limestone quarries at Dove Holes Dale in Derbyshire. For the benefit of visitors to the High Peak District of Derbyshire, and to enable readers to visualise what it was like, this chapter examines the former tramway, whose primary purpose was to transport limestone from the quarries down to Bugsworth Canal Basin where it was transhipped into boats to be taken, via Manchester, to the Mersey Basin and far beyond. Apart from losses due to road schemes, with some industrial and housing development, the tramway is almost entirely present throughout its length. Most losses have occurred in the Milton  Chapel-en-le-Frith  Townend section of the tramway. Much of the land was sold after closure of the tramway and this means that nowadays it is no longer possible to walk its complete length. There are no rights of way over the privately owned sections. Leaving Bugsworth Canal Basin, with its unique collection of remains of the former marshalling yards, canal wharfs and buildings, the main line climbs gently eastwards alongside the left bank of the Black Brook. On our left, just beyond the Navigation Inn, there is a well-preserved example of a tramway wharf where goods were loaded and unloaded. Canal terminology was used throughout the tramway, so the word wharf was used at transhipment places instead of the more customary platform. Further along, on the right, a branch line from Barren Clough (gritstone) Quarry joined, via a tunnel, but now the heavily wooded slopes of an embankment of the Whaley Bridge and Chapel-en-le Frith bypass (A6) dominate the scene. This quarry opened in 1854 at which time the adjacent Crist Quarry closed. It remained open until 1924 and a section of the tramway tunnel is still extant but this lies on the far side of the bypass. On our left, two stone-built skew bridges now come into view, and these were built for an elevated branch line to the New Road lime kilns in Bugsworth. One bridge crosses the old road between Macclesfield and Chinley while the other crosses the Black Brook. Both bridges make the crossing at a slant, hence the term skew bridge, and the only method of building bridges of this type was to lay the arch stones on spiral courses. No other elevated tramway is known and, as a result, this one is believed to be only one of its kind. Further along on our right, a branch line from Crist (gritstone) Quarry joined. This quarry opened in 1794 when beds of good quality non-slip gritstone were discovered as the tramway was being built. A glance to our left shows that the vertical distance between the main line and the elevated tramway is becoming noticeably less as we climb the gentle gradient and soon we reach the turnout where it left the main line. Ahead of us lies Whitehall Works, which once had its own private branch line and sidings, but there is still a mill pond that stores water from the Black Brook. Whitehall Works has seen many changes over the years and it has been a paper mill, cotton-weaving mill, bleach works and dyeing works. It is interesting to note that by-products of limestone were used in many of the industrial processes utilized here. Leaving Whitehall Works behind us, we cross the sites of two level crossings in the hamlet of Whitehough. The first was Lower Whitehough Level Crossing and the second was Higher Whitehough or Green Lane Level Crossing. Some distance ahead of us, on our left, is Forge Mill, which was also known as Hall Heyes Works. This has been an iron-bar slitting mill, paper mill and bleach works. Forge Mill had its own private branch line and sidings but there is still a millpond that stores water from the Black Brook. This mill also utilized by-products of limestone in its bleaching process. Moving on from the mill, we arrive at the site of Bridgeholme Green or Charley Lane Level Crossing. Beyond here, Ferodo/Federal Mogul uses the next section of the tramway to test vehicle brake and clutch linings. Ahead of us lies Chapel Milton Wharf. This was the projected terminus of the Peak Forest Canal under the 1794 Act of Parliament. A flight of 12 locks, known as Whitehough locks, would have been required to lift the canal to this level, the first of which would have been adjacent to Bugsworth Wharf by the Navigation Inn. To procure a water supply for these locks, a reservoir would have been constructed by Hockham Brook near the hamlet of Wash.
An interesting feature at Chapel Milton is the arrangement of the railway lines, two of which tower above us on stone viaducts. These form two sides of a triangle with concave sides. The third side lies in a cutting on the far side of the Black Brook. Beyond Chapel Milton Wharf, the confluence of Hockham Brook and Black Brook is on our left and, as the line bends to the right, we arrive at Stodhart Tunnel. Stodhart Tunnel is certainly the oldest railway tunnel in Derbyshire and it is arguably one of the oldest in England. The northern portal was destroyed when Buxton road was widened in 1949 but the southern portal is still extant. For a while Ferodo/Federal Mogul used it as a laboratory. It is now appears on the at most risk list of buildings and structures compiled by Derbyshire County Council. Following on from there, the line crosses the Black Brook, on a stone bridge (no longer extant), and then across the site of Bowden Green Level Crossing to reach Chapel-en-le-Frith and Townend. The large Ferodo/Federal Mogul factory lies on our right but the surrounding area at this point has altered considerably following construction of the bypass and building development. The tramway bridge at Chapel-en-le-Frith seen from the left bank of the Black Brook looking downstream. Left is to Stodhart Tunnel and Chapel Milton and right is to Townend, December 1977. 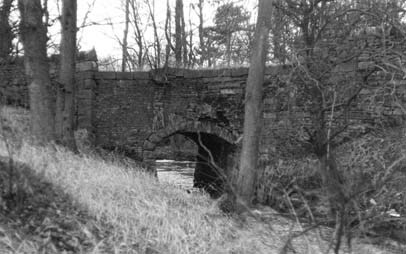 This bridge was destroyed in the mid-1980s during construction of the Chapel-en-le-Frith bypass. At Townend there were once extensive marshalling yards on both sides of the line, the Lower Warehouse, a mill and the iron foundry of H & T Kirk. After passing by the site of the Sheffield Road Level Crossing (which is now a busy main road) the Upper Warehouse and Buxton Road Bridge are reached. Some of the original buildings in this section are still there but the tramway bridge hole was walled up many years ago. The line crosses over the Black Brook again at this point, which is in a culvert. Immediately on the far side of this bridge is the Great Inclined Plane at Chapel-en-le-Frith. At the foot of the plane there was a disc signal, which was visible by the brakeman in his tower at the top of the incline. On foggy days or when it was dark, a bell was used instead to notify him that he could release the brake and commence the movement of wagons over the plane. It was always arranged that there were sufficient full wagons at the top to haul up the empty ones from the bottom, their speed being controlled by the brakeman. Having ascended the incline, we pass the site of the brakemans tower, the former marshalling yard and workshops and here the line is adjacent to the boundary of the Peak District National Park as it passes along Barmoor Clough At the Top of Barmoor Clough the line skirts around a small hillside spur to arrive at Lodes Knowle, while the Buxton-Whaley Bridge railway line tunnels through it. Lodes Knowle was the original terminus of tramway and here there was once a 33yd-long inclined plane, operated by a horse gin, which gave access to a limestone quarry. There was a double track on this plane but the fact that a horse gin was used indicates that there was an imbalance between descending full wagons and ascending empty wagons. The remains of this quarry, now overgrown, are still visible on the far side of the Buxton road. Shortly after opening, the demand for limestone outstripped the output of this quarry, so the tramway was extended into Dove Holes Dale. Just ahead of Lodes Knowle Quarry the line passes into a cutting and then under the double-arched Lodes Well Bridge to arrive at Blackhole. This was a stone-built terrace of six cottages having a single-storey outhouse at the near end. It was provided with its own tramway wharf, which extended along the full length of the terrace. After Blackhole the line turns left before passing below Buxton road. This bridge is not original, as this was demolished to make way for the present bridge, which was capable of withstanding the increased weight of traffic. The original bridge was designed in the manner of canal bridges and it had a lozenge-shaped notice at either end warning users that a weight restriction was in place. On the far side of the bridge the cutting becomes narrow as we climb the short distance towards the former limestone quarries at Dove Holes Dale where the line disappears. Under the 1794 Act of Parliament, the Peak Forest Tramway was planned to be just over 2 miles long from Chapel Milton Basin to Lodes Knowle Quarry, which was the original terminus of the tramway. The output of this quarry soon became insufficient so it was extended into Dove Holes Dale. Had the tramway actually commenced at Chapel Milton, as planned, then its overall length would have been about 3¼ miles but in the event this did not happen. The Peak Forest Canal Companys Consulting Engineer, Benjamin Outram, and Resident Engineer, Thomas Brown, advised that the proposed reservoir by Hockham Brook at Wash would be insufficient to guarantee an adequate supply of water for Whitehough locks and the short summit pound at Chapel Milton. The engineers required the summit pound to be as long as possible, so that it could also act as a reservoir but the terrain was such that this was impossible. Accordingly, the Company took the advice of their engineers and made their decision to terminate the Peak Forest Canal at Bugsworth. This was the farthest point towards the limestone deposits that the canal could be cut and still be on the same level as Marple top lock. Following on from this, the proposed Chapel Milton Basin simply became Chapel Milton Wharf on the Peak Forest Tramway. Had Whitehough locks been built then the bottom lock of the flight of 12 locks would have been located at Bugsworth adjacent to the Navigation Inn. The present terminus of the canal flanking the Inn does have the superficial appearance of being an entrance to a lock chamber and this feature has been the subject of speculation over the years. If an attempt had been made to extend the canal further than Bugsworth then it would have required cutting in an increasingly deep cutting and the outcrop of gritstone rock at nearby Lower Crist would have soon rendered the work impracticable. The completed canal and tramway opened for trade on Wednesday, 31st August 1796 and the tramway was, for the above reasons, increased to about 4¾ miles in length between Bugsworth and Lodes Knowle Quarry. As we have already seen, the tramway was soon extended into Dove Holes Dale and its overall length became a little less than six miles. As discussed previously, a 33yd-long inclined plane was provided at Lodes Knowle Quarry, which was powered by means of a horse gin. This consisted of a horse harnessed to one end of a long horizontal pole, which was attached at the other end to a vertical shaft coupled to a horizontal rope drum. It is known that the plane was double tracked, so this meant that a hemp rope was wound, say, 1½ turns, around the rope drum and then the short end would be hooked to full wagons at the top of the plane and the long end would be hooked to empty wagons at the bottom. When everything was ready, the horse would be obliged to walk around the vertical shaft to lower and raise the wagons and the weight of the descending full wagons would assist the horse to do its work. This arrangement suggests that there was often an imbalance between full and empty wagons, otherwise it would have been a self-acting inclined plane and the horse could have been dispensed with. The effect of this was that the horse was sometimes the provider of motive power and at other times it was acting as a brake. When the tramway was opened it was single track throughout its length except for the Great Inclined Plane at Chapel-en-le-Frith and short inclined plane at Lodes Knowle Quarry. The cast-iron rails were of L-section design, 1 yard long and weighing about 56 pounds. They were 4 5/16 inches wide with a flange on the inner edge 3 inches high at both ends and 3¾ inches high in the centre. Benjamin Outram & Co of Butterley in the Amber Valley near Ripley, Derbyshire, supplied these rails and they were sometimes referred to as gang rails or plates. It will be recalled that Benjamin Outram was also the Consulting Engineer to the Peak Forest Canal Company. Unlike modern railways, which use edge rails and flanged wheels, this technique was the opposite way round in that it used flanged rails and edge wheels. The origin of this design lay in the early days of coal mining when it was convenient to be able to move coal from underground to the surface in wagons, which could be used both on and off rails. Two Committee Minutes of the Peak Forest Canal Company are of interest. 4. Outram to supply Peak Forest Canal Co. with Cast Metal Railways by Benjamin Outram and Co. Clerks to affix Seal. 5. Draft of Contract between Outram and Co. for Cast Iron Railways and Plates is approved. Clerks to affix Seal. The rails were fastened directly onto stone sleeper blocks set into the track bed and they were positioned at a gauge of 4 feet 2 inches, measured inside the rail flanges. A weakness of this design was that adjacent sleeper blocks were not tied together and with the passage of wagons over them, and the effects of the weather, they moved and this altered the gauge. This was a cause of many wagon derailments. The sleeper blocks had a hole in the centre into which an octagonal oak plug was inserted. The rails were cast with a tapered rectangular slot in the base at both ends, where it was locally thickened to improve the seating on the sleeper blocks. The slots of abutting rails thus formed a tapered rectangular hole through which a wrought-iron spike, having a matching tapered rectangular head, was driven into the oak plug in the sleeper block and this arrangement secured the rails in place. The action of wagons, passing over rails, caused the stone surfaces below the rails to wear and create grit. This grit, mixed with rainwater, produced an effective grinding paste, which accelerated the wear and soon deep grooves were being worn across the tops of the sleeper blocks. The effect of this was that the rails became loose and misaligned and this became another frequent cause of wagon derailments. All Plates and Pedestals to be examined at Bugsworth prior to being sent up to the Limestone quarry. The Pedestal not to be dished out (i.e. concave) in the manner that some have that were pointed out, but quite flat upon the surface. An examination of surviving saddles shows that this must have been a problem and to overcome it the saddle surface was eventually made slightly convex and an additional improvement was to interpose a small rectangular shim of wrought iron between the rail and the saddle. At level crossings, U-section rails were used instead of L-section rails and at turnouts (points) special rail sections were used to enable wagons to change direction. Over the years, the rails and saddles experienced many design modifications but the method of fixing the rails with wrought-iron spikes was never changed. There is no evidence to show that wooden sleepers, as used on railways, were ever established on the main line but there is evidence to show that they were used in marshalling yards where the track layout was periodically altered. The use of wooden sleepers guaranteed a stable gauge between the rails. The most significant improvement came in circa 1865 when much of the main line was replaced by L-section steel rails 9 and 12 feet long, rolled at the Gorton Works (Gorton Tank) of the Manchester, Sheffield and Lincolnshire Railway Company. By that time ownership of the Peak Forest Canal and Tramway had passed to that railway company. Another innovation was that standard railway fishplates were fitted to the rail flanges to connect the rails together. For a long time it was believed that steel rails were only used on relatively straight sections of track but new evidence shows that, where necessary, they were bent into shallow arcs to enable them to be laid on curved sections of track. The standard wagon on the Peak Forest Tramway was the mineral wagon, which was used to transport limestone from the quarries down to Bugsworth Canal Basin. It had a net weight of between 0.8 and 1 ton and it usually carried a load of between 2 and 2½ tons. It consisted of a wrought-iron rectangular container, of riveted construction, which was mounted on a heavy wooden chassis to which it was secured by means of a wooden wedge on each side. This wagon design was an early example of containerisation in that the two wedges could be removed to permit the container to be lifted off a wagon and placed into a boat. However, there is no evidence to show that this practice was ever used on the Peak Forest Tramway and Canal. The wheel axles were bolted onto two axletrees fastened to the underside of the chassis. The cast-iron spoked wheels, which were about 20 inches in diameter, were secured to the axles by a linchpin, known as a lily-pin. A large washer was interposed between the linchpin and the wheel hub to reduce wear on the hub. Amazingly, water was sometimes used to lubricate the wheels and this was carried in a can attached to the side of the wagon, from which it dripped onto a wheel. As cast iron is a brittle material, it is not surprising that breakages of rails and wheels was a regular event and to deal with this eventuality spare parts were routinely provided throughout the length of the tramway. As the 19th century progressed, it became easier to transport coal up to the quarries to enable limestone to be burnt in kilns at the quarries. The resulting lime had to be kept dry while it was being transported down the tramway; so special high-sided wagons were introduced for this purpose. The container was of wooden construction and a tarpaulin sheet was fastened over this to prevent the ingress of rainwater. Another type of wagon was a coal wagon, which was of similar construction to a standard mineral wagon, but it was shorter in length. The only other wagon known to exist was the Committee Wagon (or Spring Wagon as it was known locally) of which only one existed. This was fitted with shafts, in the manner of a cart, and one horse drew it. The Proprietors (Directors) of the Company used this whenever they wished to inspect the tramway. It had a green leather-upholstered bench seat along both sides and the entrance was at the rear where there was a step and a small door. It was normally kept in a shed at Bugsworth Canal Basin and it is known that the management tended to use it more frequently during the summer months. Even so, it did not lie idle all the time as it was used to deliver wages to workmen along the length of the tramway. It is also known that a certain Harry Lucas used it and he was a foreman at the time of the Great Central Railway Company, who was based at the Marple Canal Depot. He used it on inspection trips up to the limestone quarries at Dove Holes Dale. It is also understood that William Pitt Dixon, who operated the New Road kilns in the 1870s, also used it from time-to-time. The existence of the above wagons does not preclude the employment of other wagon types of which no records, photographs or artifacts have survived but this is now considered to be doubtful. Two sources of power were utilised to operate the rolling stock. Loaded wagons travelled down the tramway to Bugsworth Canal Basin under the force of gravity and horses hauled empty wagons back to the quarries. Returning wagons were not necessarily empty all the time because it is known that goods were transported to factories built along the tramway. The Great Inclined Plane at Chapel-en-le-Frith operated on a different principle and this is discussed later. A standard mineral wagon usually carried between 2 and 2½ tons of limestone and a train, known as a gang, could contain up to 40 wagons. The speed of a gang was between four and six miles an hour. The Company Bye-Laws stipulated the maximum weights of cargo, speed and number of wagons that could be coupled together. However, there is photographic and anecdotal evidence to show that these bye-laws were contravened, as it was in the Companys own interest so to do. 44. If any person loads any wagon passing on any railway, tramway or stone road belonging to the or connected with the Canal with a greater weight of cargo than two tons and a half, or causes or permits any such wagon to be so loaded, he shall be liable to a fine not exceeding forty shillings. 45. If any person when in command or charge of a gang of wagons passing on any tramway belonging to or connected with the Canal causes or permits the same to travel at a greater speed than four miles an hour, he shall be liable to a fine not exceeding forty shillings. 46. If a person causes or permits a greater number of wagons than twelve to be formed into one train or gang, or to be conducted as a train or gang, on any tramway belonging to or connected with the Canal, he shall be liable to a fine not exceeding forty shillings. Wagons were loosely coupled together by chains and the weight of limestone carried on a typical gang of 40 wagons would be between 80 and 100 tons. A gang was under the control of a ganger and a nipper (apprentice) and its speed, under the action of gravity, was controlled at between four and six miles an hour. It has not been recorded how a gang was actually set in motion but it is likely that it was first hauled a short distance by horses and once it was moving under its own momentum these would be unhitched. Braking, known as spragging, controlled the speed of the wagons. To do this the ganger, sometimes assisted by the nipper, stood on a wheel axle of the leading wagon holding a three-link chain with a large hook at each end. One hook was place over the side of the container and at an appropriate moment the other hook was thrown into a wheel, which caused it to lock and skid. Shortly after opening the demand for limestone increased considerably and, as we have seen, the tramway was extended into Dove Holes Dale where a complex of new limestone quarries was being developed. By 1803 the single track could no longer cope with demand and as a result the track was made double with the exception of Stodhart Tunnel and under Buxton Road Bridge at the bottom of the Great Inclined Plane. The second track was laid in the same manner as the first, by fastening the rails directly onto stone sleeper blocks. An impression of the amount of limestone transported down the tramway can be gleaned from surviving statistics. In 1808 about 50,000 tons were carried. This equates to 962 tons per week requiring about 385 wagon journeys (based on 2½ tons each) and 42 boat journeys (based on 23 tons each). In 1824, during a four-week period, there were 207 wagons in use and 291 boats were loaded at Bugsworth Canal Basin. This equates to 1,673 tons per week (based on 23 tons per boat). In 1833 there were 150 wagons in use, each making five journeys per week. This equates to 1,875 tons per week (based on 2½ tons per wagon). Also in 1833 there were 279 boats loaded at Bugsworth Canal Basin in a four-week period. This equates to 1,604 tons per week requiring about 642 wagon journeys (based on 2½ tons each) and 70 boat journeys (based on 23 tons each). Also in 1833 about 1,743 tons per week were carried and a reserve of 3,458 tons was held in the limestone pens at Bugsworth Canal Basin. This equates to 697 wagon journeys (based on 2½ tons each) and 76 boat journeys (based on 23 tons each). These statistics are remarkably consistent and over the period 1824 to 1833 it is estimated that every year an average of 87,204 tons of limestone were transported down the Peak Forest Tramway and along the Peak Forest Canal. By the 1880s the situation had changed. An average of 600 tons of limestone and lime was loaded into boats on a daily basis. The special high-sided wagons were now transporting an increasing quantity of lime down the tramway and simultaneously the quantity limestone was decreasing but the ratio between the two is unknown. Once again, based on 23 tons per boat this equates to 26 boat journeys per day or 157 boat journeys per week, assuming a six-day week. Boats did not return empty after delivering their cargoes of limestone and lime. They returned with coal (for the kilns at Bugsworth), cotton (probably raw), vegetables, fruit, livestock, farm materials and general merchandise. Most of this was likely to be distributed within Bugsworth or from it by road, while a smaller quantity would be transported up the tramway. But, by the 1880s, the halcyon days were drawing to a close. Finding sufficient return cargo was always a problem and this factor hastened the inevitable demise of both tramway and canal. This is situated at Chapel-en-le-Frith, the bottom of the plane being in Townend. Like the short-lived inclined plane at Lodes Knowle, it had a double track but it differed in that it was self-acting and substantially larger. The track bed of the plane was not flat, having been cleverly designed to be steeper at the top (1:6¼) than it was at the bottom (1:8¼). In operation, loaded wagons, descending under the action of gravity, hauled up ascending empty (or lightly loaded) wagons. The maximum number of wagons permitted to pass over the plane at any one time was 16 (eight down and eight up). Thus, a gross weight of between 22.4 and 28 tons was being used at the top to haul up a net weight of between 6.4 and 8 tons at the bottom. In the early years, the wagons were attached to a wrought-iron chain. As the wagons passed over the plane the chain increased the weight on the down side and decreased it on the up side. It is even likely that at the time the tramway opened that hemp rope was used, but this was quickly dispensed with in favour of chain. There were three methods by which the varying weight and wagon speed could be controlled. The design of the plane, which was steeper at the top than it was at the bottom, offset to some extent the effect of the weight of the chain. Rollers were located between the rails to guide the chain and the friction between these and the chain provided some control. At the top the chain was wrapped one and a half times around a brake drum and by means of a band brake integral with it, a brakeman in a tower at the top had overall control of movement over the plane. In the event of the chain snapping, three traps were provided on both sides to catch runaway wagons. There is no record of this ever happening. As we have seen, haulage was by means of a chain, which was over 1,000 yards long and weighing about 7 tons. Even the chain wore out and it is likely that it was replaced in 1809, 1817 and 1831. A steel rope eventually superseded the chain, and this was 2 inches in diameter and weighed about 5 tons, though this could not have come into use before 1865. At the top of the plane the chain passed underground where it was wrapped one and a half times around a horizontal cast-iron brake drum 14 feet in diameter. The chain groove was lined with wooden blocks with the grain pointing outwards to increase the grip. Above the upper flange of this groove there was an integral brake wheel about 5 inches wide. On alternate wagon passes over the plane the brake drum and integral wheel would reverse direction and a fresh examination of available evidence suggests that two brake bands were used to counter this alternating rotation and not one as previously thought. The two wrought-iron bands were lined with wooden blocks on the inside with the grain pointing inwards to increase the friction. One end of each band was securely fastened to the back of the drum pit and then passed around the brake wheel in opposite directions in such a manner that it gave as great an arc of contact as possible. The other end of each band was then secured to the brake lever, via a bell crank, one being fastened above the fulcrum of the lever and the other below it. This arrangement would then allow for the alternating rotation of the brake drum. Although the brake lever was about 15 feet long, it is known that the mechanical advantage that this provided was insufficient for the brakeman to operate it and a block and tackle was fitted at the upper end of the lever to enable the brakeman to pull it. A simple disc signal, or a bell when it was foggy or dark, indicated when everything was ready at the bottom of the plane. The brakeman had a commanding view of the plane from his hut on top of the tower and when he was satisfied that everything was ready he would release the brake. It has not been recorded just how wagons were pushed onto the plane at the top and it may be that a combination of man and horse power was used. During the latter part of the 19th century and into the 20th century traffic on the tramway diminished. The chief causes of this were the arrival of railways and improved road communication. The last commercial gang of wagons to travel the complete length of the tramway occurred in 1922 when limestone from the quarry of S Taylor Frith & Co Ltd, in Dove Holes Dale, was taken down to Bugsworth Canal Basin. The sequence of events following the cessation of commercial traffic is unclear and not fully understood. In 1923 the lease of the New Line Quarry at Dove Holes Dale was transferred to S Taylor Frith & Co Ltd. In 1924 the tramway between Dove Holes Dale and Chapel Milton was closed because the limestone and lime traffic was by then being transported by rail and road. All that remained was a little coal traffic to the mills between Bugsworth Canal Basin and Chapel Milton and some infrequent loads of cloth being sent down to Bugsworth Canal Basin from the mills. In 1924 a commercial gang (comprised of some 45 wagons) transported 113 tons of gritstone down to Bugsworth Canal Basin from Barren Clough Quarry to be used to build a cottage at Combs near Chapel-en-le-Frith. This was destined to be the last gang of wagons to use the tramway commercially and simultaneously Barren Clough Quarry closed. This must be contrasted with the account of Mr Frank Frith, Managing Director of S Taylor Frith & Co Ltd, who said he witnessed this event in 1926. While the period 1922 to 1926 saw the last commercial use of the tramway it was used later for utilitarian purposes. On Friday, 31st July 1925, the London and North Eastern Railway Company Act 15/16 Geo. V cap. LII was passed. This Act formally abandoned the Peak Forest Tramway. During 1927 and 1928 T W Ward Ltd, scrap merchants of Sheffield, dismantled the tramway and used wagons over the ever decreasing track to transport the scrap to Bugsworth Canal Basin. From there it was taken by boat to Princes Dock on the Ashton Canal at Ashton-under-Lyne and from there it was taken by rail to Edgar Allen & Co Ltd, steel manufacturers of Sheffield, for melting down. In 1927 it was reported in Edgar Allen News that nearly 1,000 tons of old rails were stacked at Bugsworth Canal Basin awaiting disposal. In September 1928 photographic evidence shows a heap of mineral-wagon bodies on the gritstone wharf awaiting disposal. It was the first job of Bugsworth resident, Mr Joel Bradbury, to assist the track-lifting gang of the London & North Eastern Railway Company as they dismantled the tramway. On Monday, 8th August 1927 the London and North Eastern Railway Company took standard mineral wagon No. 174 and a turnout (points) to their newly opened railway museum at York (now the National Railway Museum). Mr Frank Frith, of S Taylor Frith & Co Ltd, supervised this operation as this company was the sole user of the tramway when it closed. The wagon was transported via Princes Dock on the Ashton Canal using the maintenance boat Joel. Mr James Hirst of Denton, Manchester, was in charge of the boat and he started his working life on the Ashton Canal as an employee of the Great Central Railway Company. In April 1929 more wagons and rails were removed but some rails were, apparently, left in situ. Between 1930 and circa 1943 the remainder of the track is supposed to have been removed. It was taken to the Gorton Works (Gorton Tank) of the London & North Eastern Railway Company, where it was melted down to make armoured tanks. In 1943 much of the track bed of the former tramway was sold. There is an uncorroborated account that some track was still left on the elevated tramway branch to the New Road kilns and that this was removed for scrap as late as the 1950s. Hiking boots or stout shoes are recommended for this walk as well as warm and waterproof clothing in inclement weather. The going is reasonably easy but the path does contain potholes, which become puddles in wet weather. Refreshment and toilet facilities are available at the Navigation Inn at Bugsworth Canal Basin. Walking from Bugsworth Canal Basin towards Whitehough, the Tramway Trail passes by riverside meadows of the Black Brook and it includes continually changing and extensive views of Chinley Churn (1,480ft) and Cracken Edge to the north and Eccles Pike (1,215ft) to the south. The Tramway Trail is steeped in the history of the limestone traffic and of the factories that lay alongside the Peak Forest Tramway and industrial archaeologists and wildlife enthusiasts alike will find something to enjoy as they explore it. The Black Brook takes its name from a stream that rises in the High Peak District of Derbyshire at a point about ¾ of a mile south west of the hamlet of Sparrowpit. It first flows in a north-westerly direction through the hamlet of Blackbrook and, skirting around Chapel-en-le-Frith, it passes below the Peak Forest Tramway in a culvert adjacent to the bottom of the Great Inclined Plane. After emerging from this culvert it turns in a westerly direction to pass under the Peak Forest Tramway again near Stodhart Tunnel and then on to Chapel Milton. At Chapel Milton, Hockham Brook joins the Black Brook and the former rises to the west of the 1,772ft peak, known as the Lords Seat, to flow through the hamlet of Wash. The Black Brook then flows onto Bridgeholme Green, Chinley, Whitehough and Buxworth, beyond which, on the approach to Bridgemont, it joins the river Goyt on its way to Stockport. The walk commences at the Navigation Inn at Bugsworth Canal Basin but before you begin take a look at the axletree from a tramway wagon, which is by the near corner of the Inn. It will give you an impression of the wagons as they travelled down from the quarries under the action of gravity. Starting on the car park, walk on, leaving the Inn on your left. On your right you will see the head of the Peak Forest Canal and as you look down it is likely that you are looking at the site of the bottom lock of the Whitehough flight of 12 locks, which was never built. Just beyond the Inn, on your left, are the remains of a tramway wharf (platform) and an electricity sub-station has been built at its left-hand end. Walking by this wharf, you will see ahead of you a grassed area that marks the site of the former tramway marshalling yard, which is now preserved below the grass. As you approach this you will see on your right a shallow cutting with a drystone wall running along the opposite side of it. This is where the main line of the tramway entered Bugsworth Canal Basin. Bearing slightly to your left, walk onto the metalled track. This was once the main line of the tramway and it marks the start of the Tramway Trail. Note the large stones that have been placed around the grassed area. These are sleeper blocks, which were dug up by the bypass construction company as they were building the bypass across the tramway somewhere around Townend. As you walk by, look for the holes, where oak plugs were once fitted, and the impressions left by the rails and saddles. Around this area on your right was the entrance, via a tunnel, to the former Barren Clough (gritstone) Quarry but there is no trace of it now. A section of this tunnel is still extant but it is on the other side of the bypass. Continue walking and soon two skew bridges come into view on your left. These carried the elevated tramway branch to the New Road battery of eight kilns. One bridge crosses the old Macclesfield  Chinley road while the other crosses the Black Brook. Note the spiral courses of stones that form the archways. When bridges crossed at an angle (skew) this was the only way in which the arches could be constructed. Observe the vertical distance between the embankment and the point where you are standing. The embankment is level while you are climbing a gentle gradient up the Tramway Trail. 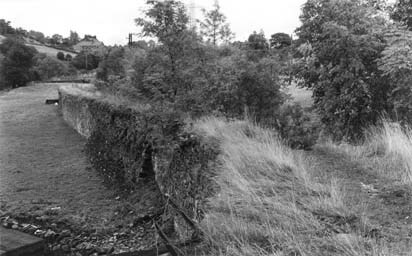 The two skew bridges on the east side of Bugsworth Canal Basin, August 1976. The bridge on the right is over the old Macclesfield - Chinley road and the one on the left is over the Black Brook. They carried the elevated tramway branch line to the New Road kilns. Note the spiral courses of stones in the arch. Walk on, and on your right is a terrace of four cottages at Lower Crist. To the left of these was the entrance to the former Crist (gritstone) Quarry, which now lies below the bypass to leave a small outcrop of rock on the hillside above. Beyond the cottages on your left you may be able to find the 15 milestone in the undergrowth. Make another note of the vertical distance between the tramway embankment and the point where you are standing. You will see that it has become much less. Just beyond the milestone, as the Tramway Trail bears to the right, you soon reach the site of the turnout (points) where the elevated branch to the New Road kilns left the main line. The location of the turnout is adjacent to the footbridge over the Black Brook. Here there are three sleeper blocks in situ and in one of them you will see a fixing hole. The elevated tramway branch line to the New Road kilns, October 1977. This view is looking east towards the turnout (points) on the main line of the tramway. As you walk along you will see on your left, the line of the old Macclesfield - Chinley road, flanked by drystone walls on both sides. Looking upwards you now start to get good views of Chinley Churn and Cracken Edge, which lies just below the summit. Chinley Churn lies within the Peak District National Park. Continue forward and soon Whitehall Works comes into view. On your left there is a field with an electricity pylon standing in it. Note the earthworks in this field, which are likely to be associated with the construction of the tramway. More good views of Chinley Churn can be obtained from this point. Walk by the cottage and on your right look out for a finger post. It is worthwhile making a short diversion here to walk up the narrow footpath until you are on higher ground. If you then turn around you will get a panoramic view of the Black Brook valley. Bugsworth Canal Basin lies to your left, Chinley Churn ahead of you and to your right you get a good view of the High Peak District with Kinder Scout beyond. Retrace your steps and when you rejoin the Tramway Trail turn right to walk by Whitehall Works, which is now occupied by PVC Group plc. The stone buildings and the chimney are all original features, which date back to the working days of the tramway. At the far end of the works you will see the mill pond, which now has a couple of islands and a fountain in it. Here you may see black swans, mallards, coots, Muscovy ducks, jackdaws, doves and farmyard ducks, geese and hens. Also look out for the occasional sleeper block in situ. Immediately ahead of the mill pond you arrive at the Lower Whitehough Lane Level Crossing. Make a short diversion here to walk along Lower Whitehough Lane (with care), noting the entrance to Stephanie Works (Whitehough Works) on your left. Stand on the bridge over the Black Brook, looking upstream, to see a weir in front of you which impounds water for the mill pond. Retrace your steps to the level crossing and turn left back onto the Tramway Trail by the No Cantering and No Motorcycling notices. This part of the Tramway Trail is used as a Bridle Path and you may well see horse riders along here. At this point Benjamin Outram built a sizeable embankment to enable the tramway to cross the low-lying land close by the Black Brook. It is about 100 yards long and in places it is 20 feet high and 40 feet wide. Continue forward and on your left look out for three sleeper blocks with fixing holes in them. Here you can pause to appreciate this attractively landscaped area and you may well see some mallards swimming in the water. Walk on and soon you will arrive at an electricity sub-station on your right. You are now at Higher Whitehough or Green Lane Level Crossing, which you should cross (with care). At this point it is worthwhile recalling that, had they been built, you would still be walking by the side of Whitehough locks. Cross over and as you continue your walk you will obtain more good views of Chinley Churn and the High Peak District. As you walk along look out for a blue plastic marker inserted into the ground by the drystone wall on your right. On the hillside over this wall you will see the remains of an ancient field system and on your left you will see the 16 milestone in the undergrowth. Also keep a look out for more sleeper blocks in situ and scattered on both sides as you walk along. The buildings now coming into view on your left belong to Forge Mill and at the far end there is a mill pond. Note the crenellated wall along this section and just beyond the pond look out for the footings of a small building on your right. Stop at this point to look over the crenellated wall opposite. Below, you will see the feeder to the mill pond and the Black Brook just beyond it. The weir for this feeder is some distance upstream. Immediately ahead, more sleeper blocks can be seen in situ. Walk on to pass by two large blocks across the Tramway Trail. On your left are the filter beds of the Chapel-en-le-Frith Water Treatment Works and ahead are the two stone railway viaducts at Chapel Milton. As you walk along you will also see an extensive group of sleeper blocks in situ. As you pass by the entrance to the water treatment works the Tramway Trail disappears below a concrete road for the short distance to Bridgeholme Green or Charley Lane Level Crossing. On your right, the bypass is now quite close to the Tramway Trail as it crosses the lane on a viaduct. On the opposite side of the level crossing, the track bed of the former tramway can easily be seen as it makes its way towards Chapel Milton but this is as far as we can go for there is no right of way beyond the level crossing. The test track of the Ferodo/Federal Mogul can be seen adjacent to the tramway and a notice advises us that this land private. Here the company tests vehicle brake and clutch linings. Retrace your steps and when you arrive back at Higher Whitehough or Green Lane Level Crossing leave the Tramway Trail by turning right onto Whitehough Head Lane, observing that you are now on a road with traffic. Walk on and ahead you will see the Chinley sign by a bridge over the Black Brook. This stone bridge is interesting in that it has a four-course arch constructed of engineering blue brick. On your right you will also see a Factory Shop sign at C V Home Furnishings Ltd, Forge Bleach Works, Chinley. A little farther along, on your left, you will get a good view of Eccles Pike. Before long the pavement stops again but keep walking on the right hand side to face oncoming traffic. The pavement starts again where the road bends to the right and here there is a bench seat that affords good views of the hills beyond Buxworth. As you walk along the pavement stops once again but keep walking on the right to face oncoming traffic. The pavement starts again on the opposite side of the road, so when this is reached cross straight over (with care). Pass by Jane Lane and the cottages at Rosy Bank (dated 1869). Ahead of these cottages the first of two railway bridges comes into view and you get good views of Eccles Pike across the valley. The lesser peak to the right of Eccles Pike is the site of Mosley Hall Pit. Coal was transported down the hillside by tramway to Gnat Hole but the mode of operation is unknown. Here there was a staithe where coal was transferred to carts to be taken the short distance to the Gnat Hole kilns at Bugsworth Canal Basin. Following Brierley Green farm you pass by Dolly Lane, which climbs up Chinley Churn. Close to the top of the lane, Dolly Pit once supplied coal for the kilns at Bugsworth Canal Basin. Coal was transported down the hillside by tramway but the mode of operation is unknown. The engine house at Dolly Pit survives but it is now a private residence. Carry on walking and on your right you will see the disused Bugsworth Station. Go under the railway bridge and observe that it is actually two bridges side-by-side. When you reach the station house sign cross straight over the road again (with care) to walk on the pavement on the other side. On your left you will see a gateway, which gives access to the Buxworth Recreation Ground. Walk a short distance down the path to the bench seat on your right. From here you get an excellent view of the elevated tramway branch to the New Road kilns. Notice that this branch is level, while the main line of the tramway drops down to Bugsworth Canal Basin behind it. Retrace your steps to the road and turn left. On your left you pass the Buxworth War Memorial Club and on your right is the former Primitive Methodist Chapel. To the right of the chapel, set back from the road, there is a tramway tunnel ,which once gave access to a gritstone quarry. The surrounding foliage obscures the tunnel portal but in wintertime it can occasionally be seen with difficulty. WPD are the initials of William Pitt Dixon who operated the New Road kilns at that time. A weighbridge was situated in the track bed outside the weigh house and each wagon was weighed as it passed by in order to determine the quantity of limestone being carried by the gang. Now walk a short distance down Brookside and when you are opposite Rose Cottage turn left and follow the path. 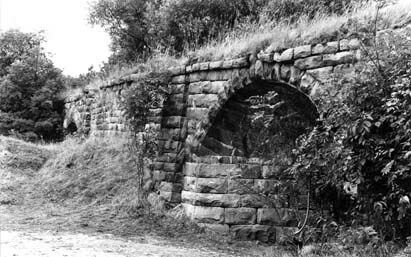 This was the original tramway branch to the New Road kilns, which crosses the Black Brook on a stone bridge. Walk over the bridge, directly turn right and then down three steps. Here you will find yourself at the end of the tramway wharf by the Navigation Inn at Bugsworth Canal Basin. There is a bench seat on your right and an electricity sub-station is on your left. This concludes your walk along the Tramway Trail and, as the Inn is open all day, you will be able to obtain some well-deserved refreshments.